American football is an interesting game that is played by a lot of people and loved by many. It is popular in many countries these days. However, football for beginners can be really confusing as one may not understand or know whatever is going on when the game starts. Also, some people may not comprehend what is going on when they watch it on TV or stadium. Most of your questions concerning football have been taken care in this article. After going through this article you will get to understand many things about American Football. 1 How many players are required in a field? 2 What are the Different Positions and how do they function? 3 What are the Different ways to score? 3.2 Extra point (one or two points) =1 or 2 Points. 4 What Is the Measurement of the Field? 5 What Is a Kickoff? How many players are required in a field? American football as originally known is an amazing game where two teams, each made up of eleven players tries to move the ball to different corners of the field to score points. Despite the fact that there are only eleven players for a given team playing at any given time, there is usually more number of players on the bench. A team can compromise of 53 professional players. This is mainly because there are various different positions that are required to play American football. What are the Different Positions and how do they function? The varying positions of football are mostly broken up into three main categories and they include special teams, defense, and offense. 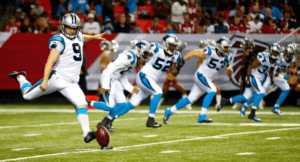 The special teams usually have the kickers, placeholders and punters on them. They must also have a couple of guys who are experts in returning kickoffs. The offense comprises of receivers, linemen, tight ends, running backs and quarterback. The defense, on the other hand, will have linebackers, defensive line and some type of safeties. Both the defense and the offense can line up around the ball in several ways. The way they line up is mostly to confuse the other team, as they will not know what they are trying to do. The work of offense is to bring the ball from their side to the other end zone. At the point when a player with the ball crosses the end zone, that team will have score six points. After which they have an option of kicking a field goal. If they kick the ball they can get an additional one or two points, depending on the conversion. Football for beginners can be somehow confusing, but with a lot of practice and determination, someone is bound to be a pro. What are the Different ways to score? Just like started earlier the most preferred way of scoring is passing the end zone of the other team with a ball. When a player with the ball crosses the end zone, that team gets six points. Extra point (one or two points) =1 or 2 Points. After a touchdown, the ball is placed at the opponent’s 2-yard line, where the offense can make it two or one points. 2 points is earned if the ball kicked reaches the end zone again. The second popularly used method is kicking of the field goal to score. A field goal comes about when a kicker tries to kick the ball through an upright. The upright is basically like a fork but it does not have the middle prong. If the kicker manages to successfully get the ball to go through the post he will have earn his team three points. The other only way that a team can use to score is tackling the quarterback especially when he is in his end zone, which is referred as a safety. When a player gets a safety for his team, he will have scored two points. What Is the Measurement of the Field? 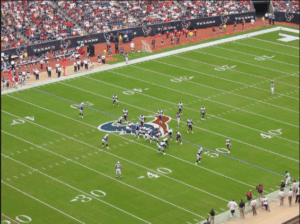 The total length of the American football field is 120 yards, although only 100 yards is used for playing. The 20 yards, which is remaining is split into two and used for the end zone for each team. Little but clear white markings are used to mark the field that helps the fans, officials and players keep track of the ball. If the kickoff is caught in the end zone of the offense, the kick returner may decide to run the ball outside the end zone. He might also just kneel at the end zone to signal a touchback; it is a sign to stop the play. An American football starts with a kickoff. A kicking tee is used to place the ball; this kicking tee is usually placed at the 30-yard line of defense. Then the ball is kicked by placekicker to the offense. A player from the offense will try to catch it and advance it by running. The point where he will be stopped will be the one, which the offense starts its series of the offensive drive. Football for beginners is the ideal article that educates newbies to understand and master the tricks of this amazing sport. As a beginner in this beautiful game, you should understand that it is divided into 4 fifteen-minute quarters, which is separated by a twelve-minute break at halftime. Timing is very important, as there is also a two-minute break at the end of the 1st and 3rd quarters of the game. Also remember that protective gears such as shoulder pads and helmet are required before playing. It is a game of high discipline and fun to play. It can be played by kids, teenagers and adults. If you do not want to play, you can just sit down and enjoy the match. Understanding the rules of the game and how it should be played is the secret of enjoying American football.